King’s English provides a means of sharing current research, ideas and activities in and around the Department of English. It showcases the department’s distinctive programme of teaching and research collaborations with local institutions, including the British Museum, the British Library, Shakespeare’s Globe Theatre, the National Theatre, and the Museum of London. Our approach is pluralist and outward looking, and we aim to create a community of readers that bridges divisions between specialist and general, creative and academic, historical and theoretical approaches to literature. 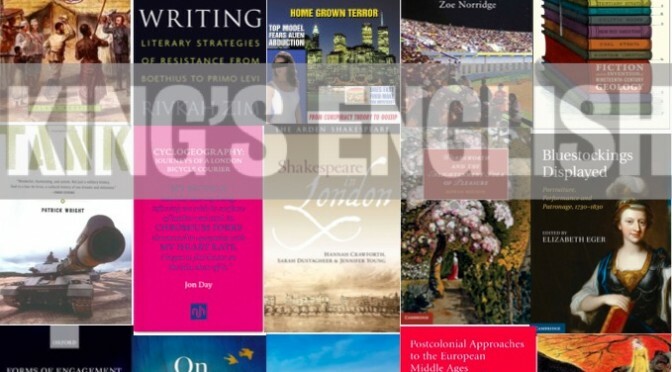 The department has grown in recent years to include around 60 academics and writers, and over 100 PhD researchers, who are committed to contemporary directions in literary and cultural studies, from the Anglo-Saxon period to the present day, across a broad sweep of geographical locations and national traditions, genres, styles and media. We welcome contributions from staff and students who work across English and other departments at King’s, or partner institutions. with thanks to Professor Gordon McMullan, Dr Elizabeth Eger, Reader Emerita, and Alice Hall, Communications Manager, Faculty of Arts and Humanities.